It is time for the Babywise Friendly Blog Network week! This week, we are all posting something about personalities. 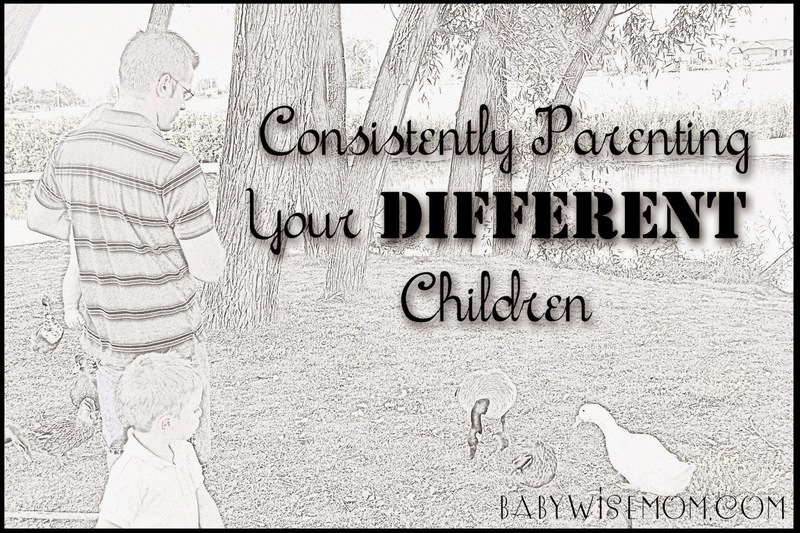 Today, I am talking about how you parent consistently in your home when your children are all different. Children are all unique. They respond to different things differently. How can you respect and respond to those different needs while still being consistent in your home as a parent? How do we enforce rules and expectations appropriately across personality and even age differences without our children forming a mutiny? How can we be consistent while still responding to the unique needs of each child? Each of your children will have unique needs. All children have different personalities, preferences, and tolerances. Some will need more time with people. Some will need less. Some will love doing outside activities; others will be overwhelmed being gone from home more than a couple of nights a week. Some will need more sleep than others. Some will absolutely need food after X number of hours. Some are quite, some are loud. Everyone has natural strengths and weaknesses. All of these things impact the way a child acts in the home. Children will also have natural trends based on birth order and love languages. Some children are just harder than others. I love the thought of some children being like parenting 101 while others are 505. Some just plain help you earn that parenting PhD. This can be just because of how you mesh with that child, while others are just more spirited and tenacious. Just like your child will have things that make her harder or easier, you will have things about you that will make you a harder or easier parent. You might be naturally impatient. You might be a control freak. You might be extremely free-spirited. Get to know yourself. Take personality quizzes to help you understand what makes you tic. My personal favorite is Please Understand Me II: Temperament, Character, Intelligence. Analyze your experiences in life. Ask yourself why you do certain things or why certain things frustrate you. Deal with things as needed so you can parent your child, not your childhood. You also want to parent what is actually happening and not what you imagine your worst fears to be. Know your limits. Know when you need to take a step back and have a five minute break. Know if you need to take 10 minutes to think before you respond to a situation or if you can rationally handle hard circumstances. Know what circumstances lead you to be either lazy in your parenting or over-reactive in your parenting. Different parent/child dynamics result in different relationships. A parent who is an oldest child will be the hardest on their own oldest child. A parent will be even harder on the child if the child is the same gender as the parent. Understand your tenancies as a parent and guard against being unfair toward a child. Recognize what you have in common with your child. We are often the hardest and most critical of traits we see in our children that remind us of things we don’t like about ourselves. Don’t take your own distaste for yourself out on your child, who really just learned or inherited it from you. I have written on fair vs. equal in the past. I think it is such a crucial thing for you to understand as a parent and for your child to understand as a human. It is not appropriate for your 4 year old to have the same freedoms as your 7 year old. Will this make your 4 year old quite upset? Definitely. Does that mean you give in and allow those freedoms? Definitely not. It isn’t even appropriate for your 4 year old to have the exact same freedoms as your 7 year old had when he was 4. Same age, but a different person. The current 4 year old might need more or fewer freedoms. Maybe the number won’t necessarily be different, but what is allowed will be different. Children are different from each other. Your children are no more the same people as you are to your siblings or spouse. You are different. They area different. Some will be more athletic than others and be able to have some physical freedom earlier. For example, one child might be coordinated enough to handle certain freedoms on the playground earlier than other children would. This same concept can be applied to many things. A child who is naturally more trustworthy might be allowed to stay up reading in bed for 10 minutes at a younger age than other children. A child who is very responsible might be given a watch at a younger age than a sibling who does not care for his things. Equal is not appropriate. Fair is appropriate. Fair means it is right for that individual child. This idea works not only in freedoms, but in discipline, too. More on that below. You will no doubt have rules in your home that apply to everyone who is capable of following the rules. You will want standard rules that do apply to all children. You will want to start as you mean to go on. The way many of those rules are followed will likely shift depending on age and ability, however. For example, you might have a rule that so much food is eaten at the table or there is no dessert. You will likely require different amounts for different children. The rules are the same for all, but the exact execution varies based on the individual. This is where things can get very hairy. Consequences should be appropriate for each child. A common trend is for parents to be more strict with an oldest child and very lax with a youngest child. Really try to have your consequences appropriate for each child individually without being too extreme in any direction. Consequences should fit the crime, but also the person. One child might be devastated to lose a privilege like TV time, while another will just say, “Eh, oh well.” If learning doesn’t take place, discipline didn’t happen. Your consequences should teach and motivate the child to not do it again. The key here is to be fair in your consequences. Being unequal really irritates children. When an older child complains about a younger child having more lax rules and consequences, you can go back to fair vs. equal and point out the many freedoms the older child has that the younger doesn’t. With increased privilege comes increased responsibility. I always find it effective to let the older child know that I am perfectly happy to move to equality among children, starting with napping schedules. None of the older children are interested in picking up the baby’s sleep schedule, so they decide it is okay to be treated differently after all. Help teach your child the skill of striving to understand life from the perspective of another person. This will help you when your child is upset by the unjust practice of different siblings being responded to differently. Parents often think the best way to make sure no child is bitter is to try to treat everyone the exact same. This is not best for the children. Help your child to understand that you are parenting out of love and doing what is best for each person as an individual. It is your job to take care of your child and teach him what is right and what is wrong. It will take practice, but put an honest effort into parenting each child in the way that child needs to be parented.